The recent House of Lords debate attracted more than customary media coverage in Sri Lanka. It is quite a long time since that has happened. One reason for this might well be that the Hansard report was made available to the media through external sources. This debate was initiated solely through the efforts of Lord Naseby who has been a consistent and politically unbiased supporter of Sri Lanka over many years. This was particularly so when the LTTE and its cohorts were riding high in the UK. At the height of LTTE activity here the British Government did what the heroic Nelson did. It appeared not to see when its own anti-terrorism laws were being flouted by banned foreign organisations such as the LTTE and British MPs were participating in LTTE events. Lord Naseby’s most recent effort was to have the British Government, its friends and the United Nations rethink some of their settled views on what happened in the last months of the military conflict with the LTTE. Lord Naseby challenged with hitherto undisclosed evidence some of the statistical and other data critics of Sri Lanka have been waving around as gospel. Unsurprisingly his call to the British Government, international critics and sections of the Tamil diaspora to reconsider some of their commonly held positions resulted in Lord Naseby receiving a large number of congratulatory and thank you messages from people in Sri Lanka. While perceptive Sri Lankans who had read Lord Naseby’s contribution to the debate he initiated and realised the importance of the new evidence he introduced to justify his call for a recalibration of opinion, were quick to respond to his single-handed effort, the Sri Lanka Government appears to believe in the adage that silence is golden. So it is not only the British Government that has looked the other way. Its former colony now under this yahapalanaya administration has faithfully followed its colonial master. One does not expect the yahapalanaya government which has the third foreign minister in the course of six or so months to make a public display of saying a thank you to Lord Naseby. But it surely could show its appreciation by sending a private communication for few outside Sri Lanka have taken a steadfast position in calling for a more balanced approach to what is said to have happened in the last months of the war. If the citizens of Sri Lanka could show their appreciation to Lord Naseby for fighting a lone battle with British officialdom to extricate chronologically important reports sent by the defence attache’ working at the British High Commission in Colombo during those critical months, surely it behooves the yahapalanites who preach morality to say a simple thank you. There may of course be other reasons why the Sri Lanka government is doing what Nelson did. Since this government assumed office it has been trying-especially the conservative UNP- to build bridges with the West particularly the US and UK. It even co-sponsored the UNHRC Resolution of 1 October 2015 which carried severe strictures on Sri Lanka’s conduct of the war against the LTTE and made several serious allegations that pointed to possible war crimes and violations of international law. British Defence Attache’ Lt. Col Anton Gash’s confidential despatches to the Foreign and Commonwealth Office (FCO) and copied to others (their names and official positions have been deleted), even with much of it redacted tends to present a different picture of the Sri Lanka military’s conduct in the war than has been publicly stated by the British political establishment including its government. How much more of the independent views of the defence attache’ would have become public had his despatches been released with less deletions if not in toto. One might recall then Prime Minister David Cameron’s journey to the north during the Commonwealth Summit in Colombo in November 2013 behaving like the Pied Piper with a rat pack at his heels in a desperate attempt to earn some political capital. After a three-year battle with officialdom and invoking the UK’s Freedom of Information Act, Lord Naseby was handed over nearly 40 pages of Lt. Col Anton Gash’s reports which were so severely redacted that once-white paper was now black. Yet it is possible to squeeze out snippets that do provide those who know Sri Lanka and the conflict areas with some valuable information and data from reliable sources that seem to contradict the political position taken by the British Government following in the footsteps of its war ally, the US. It was these two western states that illegally invaded Iraq which joined hands to condemn Sri Lanka at the UNHRC in Geneva. Given the current government’s larger interest in cultivating the US and UK, Sri Lanka officially seems to want to give a wide berth to even the brief information available from the heavily redacted reports of the defence attache’ in order not to expose the British Government’s fault lines. One thing that Whitehall cannot claim is that the defence attache’s reports were only seen by the FCO. I have seen copies of those reports released in driblets to Lord Naseby. The FCO must surely have run out of black ink in its marker pens when drawing that multitude of lines across the contents of those reports and in deleting the numerous names of recipients to whom some of those despatches were addressed. The names and designations of recipients deleted are proof that the reports were available to a much wider circle of officials, especially in the defence departments, than only to some at FCO’s South Asia Desk. So it cannot be claimed that sections of the political establishment could not have been privy to the contents of Lt. Col Gash’s despatches that also carried conclusions he draws and predictions he makes. Sri Lankan forces is that the FCO could not produce any despatches sent by Lt. Col Gash after 26th April – that is during the crucial three weeks leading to the end of the war. The final battles against the LTTE had already begun and were moving towards an inevitable denouement. There was obviously international interest in the humanitarian situation that had been building up over several months. We know that the West, especially the US, UK and France, were making efforts to have Sri Lanka call a ceasefire so that what is left of the LTTE leadership could be evacuated to safety from Sri Lanka. It beggars belief that at this vital stage in the conflict where the LTTE was presumably going to make, like General Custer, its last stand, the British Defence Attache’ who had all these months reported on the conflict and the humanitarian situation would suddenly abandon his prime duty of sending despatches and take a vow of silence like the Sri Lanka government’s attitude to the Naseby debate. I have known Lord Naseby from the early 1960s when he was working in Sri Lanka. My brother Mervyn knew him better for I had just started my journalistic career when I met Michael Morris, now Lord Naseby. I renewed contact with Lord Naseby when I came to London as the Europe Editor of the Hong Kong Standard newspaper in 1989. Since then I have attended several of the debates he initiated and also events he chaired as the Chairman of the All Party Parliamentary Group on Sri Lanka and had lunch with him in London and in February this year in Colombo. Though he is no longer chairman of the group he is its president and continues to take an active interest in presenting Sri Lanka’s case in the UK far better than some of those officially mandated to do so. Lord Naseby’s commitment and affection for Sri Lanka is beyond question. What sticks in the craw is when some others try to take credit for this debate and claim that this is the result of two months or so of “hard work” by them. Those who are novices to British politics and the parliamentary system should not mistake this for, say, ‘democratic’ governance in the Gulf states. It takes much effort to secure a debate in one’s name. As Lord Naseby told me he put in his name asking for a debate on June 21, the day of the opening of parliament and when some of the current claimants to ‘authorship’ were hardly around. When I was Deputy High Commissioner here earlier in this decade we worked closely with Lord Naseby, (as with some other Lords and MPs), providing briefing papers when needed and updates on developments in Sri Lanka thus keeping him in the loop. It was the time anti-Sri Lankan feeling was very much in evidence and widespread, especially with regard to Sri Lanka hosting the Commonwealth summit, the murder of a British aid worker Khuram Shaikh in Tangalle and a dispute with the International Bar Association over visas to enter Sri Lanka. It was necessary to cultivate all party contacts in the Lords and the Commons and keep them up to date on developments. Not only was it necessary to provide brief analysis but make briefing notes available in a timely manner, not send notes on, say, Tuesday when they were required the previous Friday to be of any use as seems to have happened here. 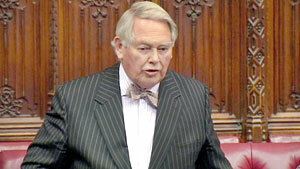 Fortunately there are very helpful Sri Lankans outside official circles as Lord Naseby noted in his speech. One question does arise. Where have all Sri Lanka’s critics gone? I remember being present at debates where strong Labour Party voices were raised against Sri Lanka even in the Lords. I remember when then High Commissioner Chris Nonis and I had quite an exchange with Lord Wills, a supporter of the Channel 4 features against Sri Lanka, at the parliament restaurant. For some reason the critical voices against Sri Lanka seemed to be stilled this time except for an occasional comment on speeding up reforms. If one is to challenge remaining dissenters then we should have strong, educated and articulate voices such as Lord Naseby to do so and not depend on a picayune presence of little worth.